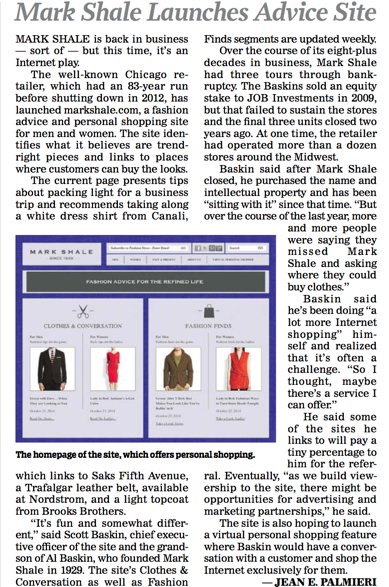 Mark Shale, a Chicago retailer that closed in 2012 after 83 years, announced the launch of a personal shopping and advice site. The new website, Markshale.com, will cater to both men and women by identifying en vogue pieces and links to places where customers can buy the looks. The well-known Chicago retailer, which had an 83-year run before shutting down in 2012, has launched markshale.com, a fashion advice and personal shopping site for men and women. The site identifies what it believes are trend-right pieces and links to places where customers can buy the looks. Mark Shale has been a leader of the fashion industry in Chicago since 1929. Although the retail business closed in 2012, that hasn’t stopped Mark Shale at all! In August it launched its very own website, markshale.com, that will offer both valuable fashion advice and personal shopping resources.